Our ultra-light boat trailer (previously called the Kayak Trailer) is ideal for pulling a kayak or paddle/surf board behind your bicycle. The trailer consists of two components: the two wheeled cart. The cart fits under your kayak and has two folding, padded supports. Our ultra-light design is made of aluminum, and 16” bicycle wheels which can be quickly removed for storage. 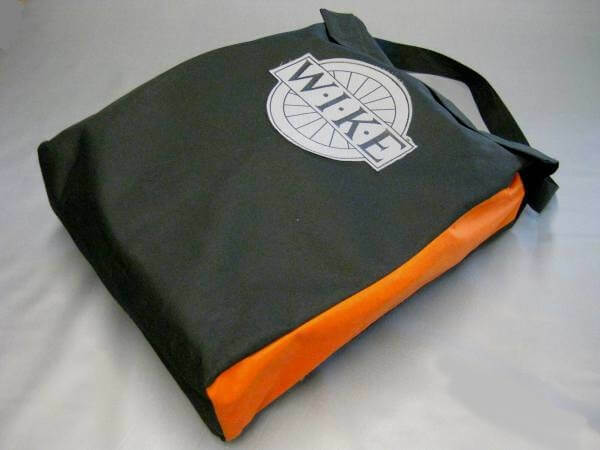 It can carry a maximum of 75 lb behind a bicylcle or 100 lb if pulled by hand. The cart holds the boat above the wheels, so it can hold a boat of any width, however, wider, heavier boats will be top heavy and wobbly. (A wider size that will fit canoes is in development!). This cart keeps the canoe 17" off the ground, but the axel is 6" off the ground. The cart can also be used for portaging and pulling the boat by hand. Your boat or board must have a bow handle, bow ring or bowline to tie the boat to the end of the Smart Stick. The Smart Stick consists of a seat post hitch which bolts to your seat post (fits on posts from 1” to 1.5” (25 - 38 mm) in diameter) and an aluminium extension tube that reaches above the rear wheel of your bicycle to connect to you boat. Using the Smart Stick, the pivot is at the boat, so it's harder to keep the boat straight behind the bike, however, as long as you are careful and don't stand on your bike pedals, it will be fine! Our boat products are built entirely in our Guelph, Canada factory and are shipped directly to you.Our ultra-light boat trailer is the only boat trailer/cart sold from our warehouse in Europe. A pack with a shoulder strap that can hold ultra-light boat trailers including the cart, 16" wheels and smart stick. The pack is a tidy velcro closing bag.